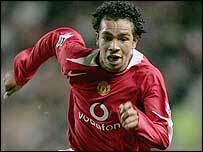 West Bromwich Albion have clinched the loan signing of Manchester United winger Kieran Richardson. "I'm definitely happy to go out on loan and get some experience," said the 20-year-old. "I also want to show what I can do because I believe I have a lot to offer West Brom." The 20-year-old has only made two appearances as substitute in the Premiership this season and made nine outings in total. Richardson also paid tribute to his new boss Bryan Robson. "He's a legend at Manchester United and it's an honour for me to go and play for him. I just can't wait to get started really," added the player. "West Brom are a hard-working side and the manager has stressed to me how important the work ethic is to his team - that isn't a problem for me and hopefully I can bring a bit of creativity to the team as well."